As many of you know, I use my beloved daily planner every single day to help me list, process, organize, and structure my days and weeks. However, during busy seasons of life, I often write my daily to-do list on a standard-size sticky note and stick it to the corresponding page in my planner. Although it “wastes” one extra piece of paper, I’ve learned that using a sticky note for my to-do lists usually helps me keep my daily list more manageable — so I can actually accomplish the majority of my list each day (instead of feeling defeated when I move half the to-dos to the next day). In fact, over the last 2-3 months, I’ve regularly accomplished all (or almost all) of my daily to-dos, even with a new baby, the busyness of back-to-school, and all the extra holiday activities. This is not because I’m super woman and it’s not because I work all night long. It’s simply because I’ve gotten very good at making manageable to-do lists and knowing when enough is enough. I know that if I have to write teeny-tiny just to fit everything on my sticky note, I’m probably trying to fit way too much in one day and setting myself up for failure. On the other hand, if I can easily fit the following day’s to-dos on one sticky note, I know I have a pretty good chance of completing my list before I go to bed at night. Of course, there are always days that are more full than others, as well as days when things don’t go according to plans and I basically accomplish nothing on my list… but more often than not, my sticky note trick works wonders for me! 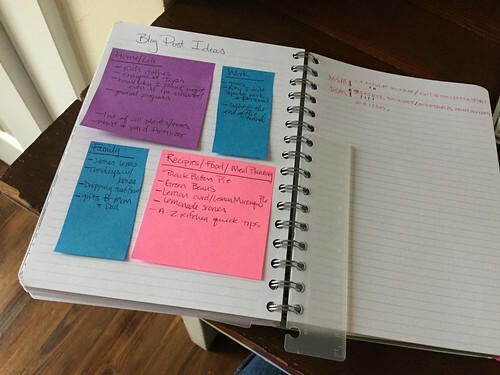 I actually use my sticky note trick to keep track of blog post ideas, gift ideas, and long-term goals and projects too. I love how quick and easy it is to move the sticky notes around within my planner — everything stays neat and in one place where I can easily find it. If you struggle with too many to-do’s, try limiting yourself to what you can fit on a sticky note. If your sticky note can’t hold everything you want to or “have to” do, I’d suggest taking a long hard look at your daily and weekly schedules. Is there anything you can give up? Anything you can delegate to someone else? Anything you can pay someone else to do for you for the time being? Anything you’re doing just because you feel guilty saying ‘no’? You might be surprised how many items you can remove from your to-do list once you sit down and really think through things. I know it won’t happen overnight, but eventually, you will start to better manage your daily to-do’s — and you’ll most likely be much happier and less stressed as a result! I always, always, always make my to-do list the night before — this way, I can organize my list, decide what the most important tasks are, and start mentally preparing for the things I want to accomplish the following day before I go to bed. Then, when I wake up, I can just jump right in and get to work. 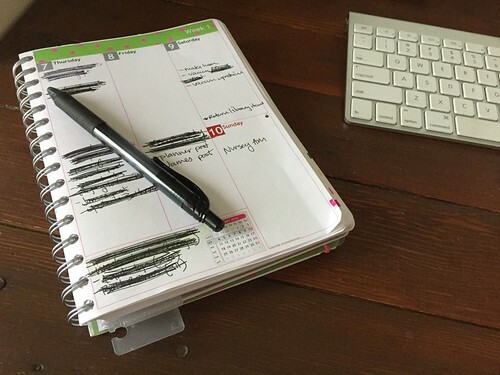 Do you have any tips or tricks for making manageable to-do lists? Maybe I skimmed this too quickly, but I don’t see how writing your to-do on a sticky note and putting it in your planner helps you accomplish more than just writing the same list in your planner? What did I miss? Thanks for clarifying. The point of using the sticky notes for me is not to be more productive, it’s simply to create a more manageable to-do list each day so I’m not always discouraged with a long list of things undone at the end of the day. 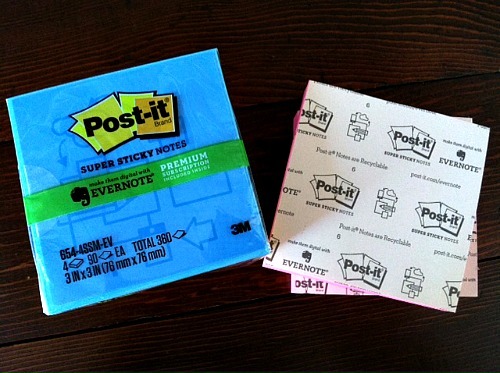 If I limit myself to using a sticky note, I know I won’t try to over-do it! I love the word ‘manageable’ you use, as that will vary from person to person. What is that quote? “people over-estimate what they can do in a day, but underestimate what they can do in a lifetime” Maybe this is just me, but I would add to not be afraid to add the small and/or creative things to your list. 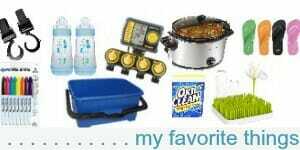 When I first started making to-do lists, I felt a bit silly writing some things down like “make crock-pot dinner” or “quality time with son”, …thinking others peoples lists were probably more productive and thoughtful than my own. But then I realized how wonderfully useful it became for me to write down what took priority for me at that particular time in my life, and helped me get a better grasp on how much I could truly handle in a day, and adjusted my lists from there. Maybe what I’m trying to say is that you don’t have to have a super busy life to utilize lists, lists are just great for focused thought and action. 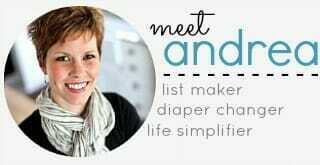 Thanks for the post today, Andrea! Yes…that is good advice too! I like to put simple things on my list as well. Simple things are easy to forget about too. This concept is described in detail in the book “The Checklist Manifesto” by Atul Gawande. In this book, he talks about how simple checklists have revolutionized results in certain industries such as healthcare (time-outs for ORs, reduced infections when inserting central lines), airlines, construction, etc. 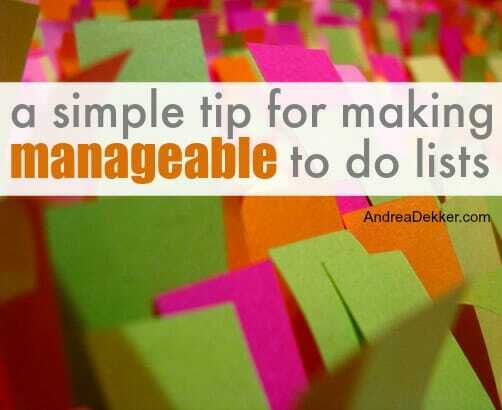 yeah, I think “manageable” is key — because every person can “manage” different things! And yes, I too write down things like “do a craft with the kids” or “make dinner”. you are not alone! Great idea Andrea! We use the Happy Planner and cut notebook paper into half sheets and punch them so we can fit them on any page! I got tired of writing things to remember on anything I could find, this keeps me organized. That’s almost exactly how I use my planner. In fact my boys recently had a great time teasing me recently because I scored a 15-pack of bright colored Post-It notes for $5 and you would have thought I had a winning lottery ticket I was so excited! Gotta love a good reason to buy pretty office supplies! The semi-permanence of sticky notes makes jobs feel more doable, as well as easier to decide the job is not a priority so it can be thrown away. That’s good for me as a homeschool mom who also works from home. I have little sticky notes I use to write jobs for my children. Last night my daughter, who is four, told me to write down four jobs to post on her morning routine chart. Seriously. Not making it up. She loves to work; I am aware that I’m very blessed. The children like throwing each note away as the job is done. Using notes helps me assign the right amount of work to each of them, of course using The Right Color for each child. ah yes… the “right color” heaven forbid I give Simon anything but blue!! Sticky notes are my favorite. When I moved I used them to track my projects and it kept me on top of them all. 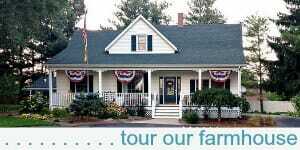 I use them to put notes on the front door for the family too. So many uses so many colors! !